Welcome Travel Agents! Dolphin World Travel would like to offer you 5% commissions per Participant, depending on which program you reserve for your customer. The higher the price of the program, the more money you will earn!! A great way to earn extra money with an activity your customer really will enjoy. In order to earn the money, you need to mention “Swim with the Dolphins” to your customers and watch their faces light up. It’s an easy sale!!! With constantly changing airfares and schedules, thousands of vacation package choices, and a vast amount of information available on the Internet, travel planning can quickly become frustrating and time consuming. Dolphin World would like help you, the agent, service your customers, simplify the process, and boost your commissions. At Dolphin World, we understand the challenges facing today’s Travel Agents in a changing and competitive marketplace. With commission payments ceasing from domestic airlines, in addition to competition from low-cost Internet fares, many agents find themselves in a difficult position. Dolphin World would like to help. In an effort to find a profitable niche in the market, many agents are specializing in travel to certain regions or for certain people groups, such as honeymooners, grandparents, or adventure travel groups. Dolphin World Travel Programs please a variety of customer groups and could be just the niche you are looking for to service your clients. Once you asses your customer’s vacation needs, simply contact Dolphin World. We’ll help you make the best possible travel arrangements to give your customer the perfect vacation experience. Our unique Swim with the Dolphins programs turn an average vacation into an extraordinary event. 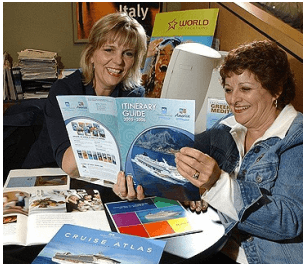 The Dolphin Workshop Programs are even a great additional sales commission for you when you book cruise lines, resorts, and specialty travel groups for Miami, Orlando, Florida Keys, Hawaii, Mexico, Dominican Republic, Bahamas, Jamaica, Tortola, & Grand Cayman. Dolphin World will help you give informed advice on all our destinations and make the optimum arrangements for your clients, including transportation, hotel accommodations, car rentals, tours, and recreation. Dolphin World will make it easy for you to promote our Swim with the Dolphins and other activity programs. That way, you can remain focused on the more important aspects of your job, like obtaining new clients. Dolphin World even helps Travel Agents that are handling large groups, incentive travel programs, special-interest groups, and company-sponsored trips to our travel destinations. Submit the form today to find out how Dolphin World can help you. We look forward to establishing a beautiful partnership together.